Fitted to the new GPX graphics cards, SLI bridges are now available. But they aren't just simple SLI bridges: through the option to plug 5mm LEDs into the SLI bridge, its colour can be matched to your system as well. 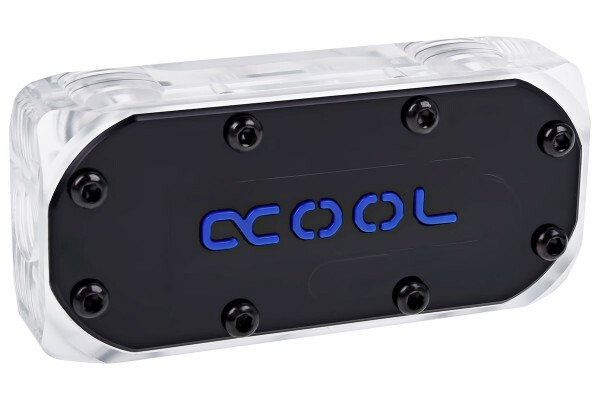 The Alphacool logo is illuminated through a 3-pin connection with pre-installed LEDS. 2 graphics cards can be cooled with the SLI connection, in which flow passes through the coolers in a row. Installation is very simple using the included fittings. The special connectors have a ¼" thread on one side and a straight piece of pipe on the other side, which is simply plugged into the SLI bridge (double O-ring). This way it can still be installed if the coolers are already mounted. The SLI connectors may only be used to connect the same types of graphics cards. Alphacool takes no responsibility for use with different graphics cards, as there could be minimal differences in the spacing, causing the SLI connector to fit incorrectly and not lock or seal properly. Guten Tag, wisst Ihr von Problemen, wenn man diesen SLI Connector verbauen möchte und "große" SLI Brigdes (zum Beispiel von NVidia, MSI, EVGA ect.) schon verbaut hat? Ist da genügend Abstand verhanden? Vielen Dank für Ihre Hilfe. Die SLI Connectoren werden schon sehr lange verkauft und Probleme gibt es nicht. Die Abstände zwischen den einzelnen PCIe Slots auf den Mainboards ist nach der ATX Spezifikation geregelt und sind immer gleich. Hello yes you can remove it. The SLI Brige will not leaking. Thank you. Done. Much better, visually. Thanks again.